The music world was set into shock last Friday (December 17) following the news of the legendary Captain Beefheart's death. After battling multiple sclerosis for a number of years, the musician born Don Van Vliet succumbed to the disease in hospital. He was 69 years old. Since his death, a number of friends and followers have toasted Van Vliet for his contributions to music, which he forever changed. Fellow gravel-throated troubadour Tom Waits sent the Los Angeles Times a brief email message that celebrated the former Magic Band leader. "He was like the scout on a wagon train. He was the one who goes ahead and shows the way," Waits wrote. "He was a demanding bandleader, a transcendental composer (with emphasis on the dental), up there with Ornette [Coleman], Sun Ra and Miles [Davis]. He drew in the air with a burnt stick. He described the indescribable. He's an underground stream and a big yellow blimp." Waits capped the letter with a more personal remembrance, "I will miss talking to him on the phone. We would describe what we saw out of our windows." Beefheart was also toasted by the late Frank Zappa's family. A childhood friend of Zappa -- the Mothers of Invention founder produced Van Vliet's career-defining Trout Mask Replica LP -- Beefheart clearly made a significant impact on Zappa's kin. Both Ahmet and Diva Zappa tweeted their thoughts. "R.I.P. 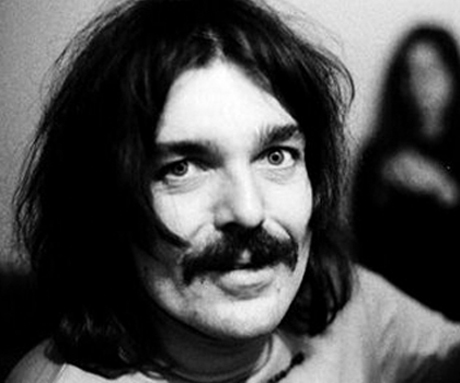 Captain Beefheart...sad day," Ahmet wrote. "Best Captain Beefheart moment. I was on the phone with him a few years ago and he asked me 'what about a platypus in a briefcase?' Love!" While much praise was given to Captain Beefheart's back catalogue, fellow magic man Penn Jillette, of Penn & Teller, saluted Van Vliet's other vocation as a painter. Van Vliet may have left the music scene after 1982's Ice Cream for Crow, but he remained active as a visual artist. "Captain Beefheart has died. Another inspiration & hero gone. He's been painting, no music for a while, but I still listen all the time," Jillette tweeted. Other sentimental tweets poured in over the weekend, from Franz Ferdinand singer Alex Kapranos to messages from Camera Obscura and Akron/Family. A message from experimental L.A. musician Zola Jesus praised Beefheart's tune before lamenting the loss. "Gave my brother my old, worn down copy of Trout Mask Replica before I moved as a thank you to introducing me to his music when I was far too young," she tweeted. "Nothing he did was a mistake, there were no accidents in his music. Only sheer invention, passion... dear god, why does the world keep losing such important people? Who will fill their shoes? My heart is heavy for you, Don Van Vliet!" Considering his far-reaching influence on the music world, we can expect to hear more about Van Vliet from the music community for years to come.